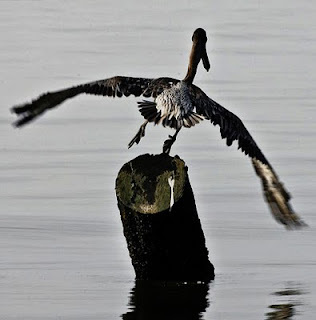 Although it appears you are more than a little busy these days, my admiration for your seemingly "quitoxic" quest to save your state prompted me to write with one more suggestion on how to fight this devastating oil spill. "This spill fundamentally threatens our way of life," you claimed from the beginning, and the unfolding of events of the past eight weeks has proved you right. Still, you take little consolation in the vindication of your prophecy, instead forging ahead while at the same time besieging the others, from BP to Obama, to follow. If anyone has led in this battle against (as one of the riggers called it) "the well from hell" it has been you and not Barack--which is precisely why I am writing to you and not the President about the last arena of the war you need to lead. Sure, Obama talked about praying in his "Gulf Help" (a.k.a. the "Cap and Trade Charade") speech this week, but you could tell by the vagueness of his words that he had no expertise in the area of prayer either, and that it was not faith from the heart but the teleprompter. You, on the other hand, have had much experience in using prayer to help solve crises, going back to your college days when your ceaseless "Hail Marys" helped deliver your friend Susan from the devil in what you later realized was her exorcism. 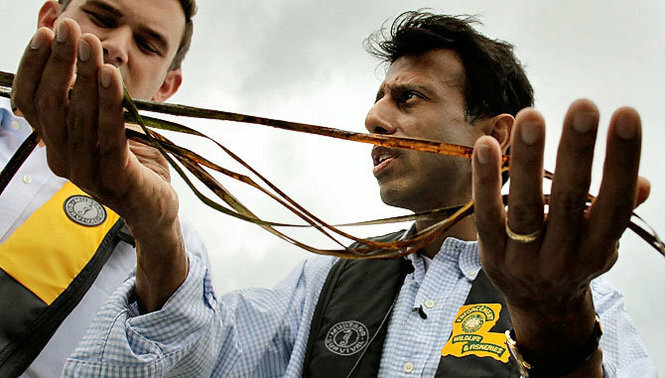 As I'm sure you recall, Governor Jindal, Susan's depression about her cancer quickly progressed from depression into despair, and you found yourself in a room with her and a bunch of Campus Crusaders for Christ and other well-meaning but green evangelicals, wanting to help but unable to do so. When you tried to join in the group's prayer, you felt "a weight on your chest," and initially could not overcome the darkness that was now taking ahold of your soul as well. But according to your 1994 article "Beating a Demon, Physical Dimensions of Spiritual Warfare," "suddenly...and strangely, I found myself repeating the Hail Mary until it became a chant. As a recent convert to Catholicism, I had yet to accept the Catholic doctrines concerning Mary, and considered [them] to be idolatry. Though I had never prayed a Hail Mary before in my life, I now found myself incapable of any other form of prayer." But as it turned out, it was your prayers, along with the intervention of a crucifix (later found to have been blessed by John Paul II) that turned the tide for Susan, and her faith in Christ was restored. But now the dark tides return to your world with another form of black death, and despite all your hard work, I believe the Lord's order will not be completely restored to the Gulf without the intervention of the rosary. Governor Jindal, I know your devotion to Mary has deepened considerably since that long ago day when you "left that room with a powerful belief in Mary's intercession," and you may be the person I least need to convince of the power of the rosary in times of world crises. From Lepanto to Fatima, the rosary has been instrumental in everything from winning wars to converting countries, and it would seem to be the perfect prayer for the still largely devout people of Louisiana. On the other hand, while you have little doubt in the power of praying the rosary, I imagine you might have grave concerns in being the person leading your state in its recitation. I realize that even an unofficial statement by the Governor of Louisiana to the effect that, "In addition to the work I will continue to do to solve this crisis, from this time forward I am also going to lead a decade of the rosary each day until the day the leak has been plugged, the Gulf has been cleaned, and the Louisiana way of life has been restored, and I am asking all those in our blessed state, the Gulf states, and these United States who believe in this special Marian devotion to now join me in this endeavour," would raise the ire of many. Agnostics and church and state separatists (or are they one and the same?) would object (falsely) with Constitutional concerns, Protestants would protest on ecumenical issues, and it wouldn't make Muslims happy because...they are Muslims! But Bobby, the difference between you and Obama, indeed the difference between you and most politicians, is that you embrace neither the strong arm politics of Chicago nor the political correctness of Washington but the policies of openness and honesty, and base your decisions not on what is popular but what is right. And if this prayer is right for this crisis, the time is ripe to begin praying it. Beautifu Letter to Bobby LA Governor. Let us pray deeply from the heart that Bobby will run for president in 2012. We certainly will need a good man as he. I am sure Our Lady sees's the good in this man and She will pursue him to run. I will be praying for him as well. THank you for posting such a wonderful letter. I am from Florida, and recently moved here. The political things here need to be change as Florida needs to put in Law a State Income Tax as for prices on food, clothes etc, will come down. Groceries and to surrive to live is rough here. No Jobs. I am amazed that no one ever thought to write to the Politacal world to introduce a State Income Tax. It will help us tremendously. Blessings to you and May Mary keep you safe in Her Heart.